So here we are again... at Me-n-Ed's. We were the only table for the longest time. It figures. I'm sure this is not the most popular place to eat on a Sunday morning. Also, with all the Olympic activities going on, there were not many diners here during lunch. Viv and I decided to share a large pizza with shrimp, capicolla, ham, artichoke hearts, tomatoes, sausage, mushrooms, chicken and anchovies (on my half). Hold on, what's with all those toppings??? 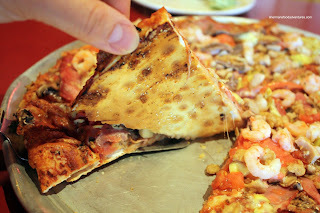 Yah, if you did this at most other pizza joints, you'd be looking at a pretty big bill. Yes, the bill at Me-n-Ed's is not light either; but at the very least, any amount of toppings over 4 counts as the same. So pile it on! 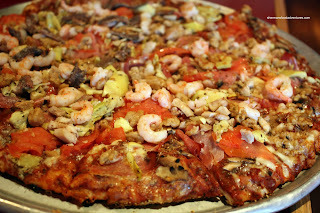 The toppings look generous and the portion big compared to Earls Californian shrimps pizza. Hopefully their 'Middlegate' branch is just as good. "Viv and I decided to share a large pizza with the entire kitchen sink"
I can't remember the last time I had a pizza loaded to the nines; makes me want to go create one. What kind of cheese is on the kiddies pie? I only ask, because it has a bit of yellow hue..mix of cheddar/mozza? Whoa. 4 dozen wings sounds like a lot when I only have 4 normally at once. I guess you mean Viv only had the wingette, not the entire wing shoulder+tips which I normally have mine done at home. He he he ... 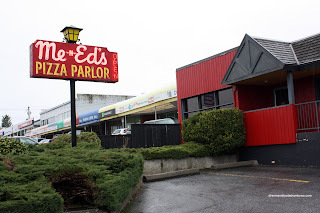 I once ordered Me-N-Eds for a team meeting once and was queried by my boss (in Atlanta) why the pizzas in Vancouver is so expensive. Needless to say, I don't order from Me-n-Eds anymore but they sure are the best because everyone loved them. ENBM, the toppings are generous. Believe it or not, even with all those toppings, it's still not that filling. 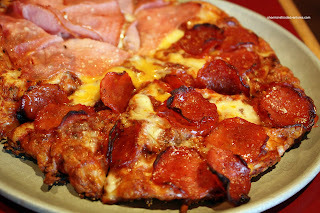 Yup, the Middlegate location is the same, http://www.shermansfoodadventures.com/2009/06/me-n-eds-pizza-parlor.html. Really? Yu-Na is in the Ramada??? I wouldn't have guessed she was there! Hi Ben and Suanne! Viv had 4 dozen in total counting the wingette and drumette as one piece each. Still impressive considering that I ate 4 dozen and felt stuffed! I like Me-n-Ed's but... so pricey! Agreed! Ben said: "I once ordered Me-N-Eds for a team meeting once and was queried by my boss (in Atlanta) why the pizzas in Vancouver is so expensive." Once an Australasia RD had sushi lunch in Tokyo with a lady colleague from Austin TX, the bill + tips came to USD250. It came back unprocessed with a terse message "impress her with your own wallet". LOVE their pizza... mostly because of their salmon pizza. it's ridiculously good and they even include some lemon. while living in north van, i was sad to see that location close. fortunately i moved to a place (abby) where me n' eds lives on. i agree with the price, i go once/year with the e-book coupon. i wish it wasn't so pricey. Yah, I went on retro pricing night at the BBY location a while back AND it was still expensive. I wish I had more of those Ent Coupons!